Yes, this page is supposed to be promoting Zumba as a form of exercise. But we all agree that there are a lot of other options that you can do to keep yourself fit. If you opt not to enroll in classes, or if you do not have time to go to the gym, you can also workout in the comfort of your home. Some people prefer working out with an exercise machine because it somehow feels more legitimate and effective. No problem with that! The most common home exercise equipment is the treadmill. A lot of treadmills these days are compact so space is not a problem. They also have pre-set programs that can guide you in your exercise. Just like a built-in instructor, huh? Best of all, there are really affordale options. 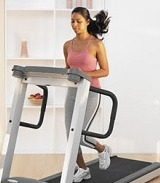 If you need help in choosing a treadmill, you will find these reviews valuable. Another exercise equipment that you can use at home is a recumbent bike. If you have back or joint problems, you will find this easier to use. Don't fret because even if they are more comfortable, these bikes also have serious fitness benefits. No-equipment workout? Definitely possible! Check out this article for some at-home exercise routines that you can do. Whatever your preference may be, I congratulate you for having the determination to push for a healthier lifestyle!